← Video of Chinese Brush Painting Techniques!! Hello everyone. 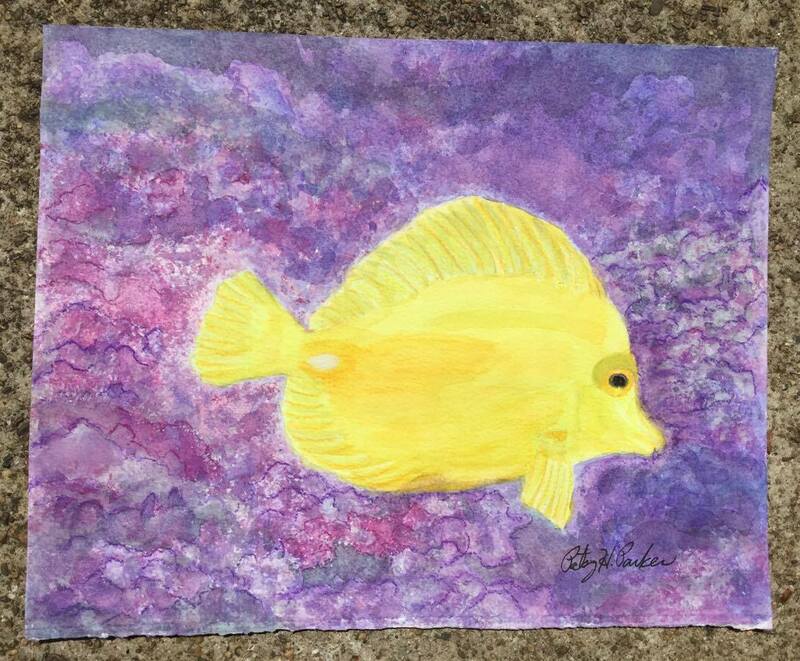 Well, here is the “secret painting!” I actually painted this Yellow Tang before my other bigger painting of the multiple Yellow Tangs, but I couldn’t share it yet until my friend, Erlene Johnson, who lives in Washington, had received it. She loves it which makes me very happy! P.S. I just learned that this is my 500th post on WordPress! I’m so excited. Posted on August 7, 2016, in Watercolor Paintings and tagged Chinese Brush Painting, Chinese painting, Chinese watercolor painting, Sumi-e: The Art of Japanese Ink Painting, Yellow Tang Fish. Bookmark the permalink. 6 Comments. Aw…he’s cute! Great job, Patsy. Congratulations on your 500th post! Congratulations on 500 posts! The yellow tang is a beauty to mark the occasion.